In the present day, something as simple as a ribbon can be found in a variety of widths, materials, and designs, and when it comes to new kinds of ribbons Japan can be justly proud in that it produces a great amount of these. In particular, I regard Japan as being number one in the world in the field of new kinds of ribbons. The ribbons developed and manufactured by ribbon maker Mokuba enjoy a high reputation throughout the world and are widely used by designers in all fields. Japan knows no rivals for the wide variety of ribbons available for use in embroidery, but I think that Japan should further pursue the limits of what can be achieved using ribbon embroidery. In the past, ribbon embroidery was used to embellish the clothing and accessories of European aristocrats, but I feel that now is the time to aim to produce new ribbon embroidery that suits our modern lifestyles. I’ve personally been involved with Mokuba from the initial stages of developing ribbons for embroidery. Unlike thread, ribbons have a width, so when they are used in embroidery even a single stitch can create something new and unique and we subsequently discovered many new kinds of stitches. I’ve also created my own personal line of design kits so that more embroiders might know of the joy of ribbon embroidery. My book, Yukiko Ogura’s Easy Ribbon Embroidery: Stitches and Ideas, has also been published by Vogue Nippon. 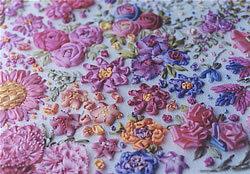 My new book, Easy Ribbon Embroidery, was published in 2008. 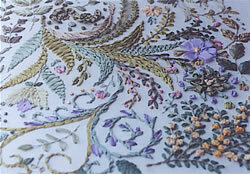 My first book, Ribbon Embroidery: Flowers, was published in 1995, and in 2001 The Ribbon Embroidery Book was published. I consider introducing the art of ribbon embroidery to as many people as possible to be an important job. I’ve traveled throughout Japan every year to present classes sponsored by Mokuba for handicraft teachers and at handicraft shops, and at present I’ve held 13 training workshops for ribbon embroidery instructors. I also opened Galerie y in 2000, and along with my Ribbon Embroidery Basic Course, my Beads Embroidery Basic Course is one of the important classes at Galerie y. In these classes we teach special methods based on my original ideas. I continue to come up with and develop effective techniques for putting the finishing touches on ever more beautiful ribbon embroidery. At a sewing festival in France my ribbon embroidery books proved to be highly popular because they can be understood by people who speak any language. Even in Taiwan there were people who enthusiastically took part in my courses in order to become instructors, and I’ve trained many, many teachers. Much to my distress, however, there have recently been those who, after only studying in my Galerie y Basic Course, copied all my original designs and methods without my permission. They have even gone so far as to copy my design kits, and are reported to be teaching the same methods found in my books in courses held outside Japan, flagrantly advertising those same courses on the Internet! I found it hard to believe that anyone would go so far, but no matter how much I try to impress upon the perpetrators that it’s simply wrong to steal another person’s designs, my pleas have gone unheeded. It makes me very sad to think that there are such people in the world. But I carry on, devoting my energies to produce even more wonderful designs and creations, because I believe that’s the only way to protect and further develop the art of ribbon embroidery. I just have to pull myself together, and carry on. Galerie y displays many of my creations. I’m quite sure that there are no other handicraft shops around that exhibit so many actual works, and it would give me great delight if you were to pay a visit. 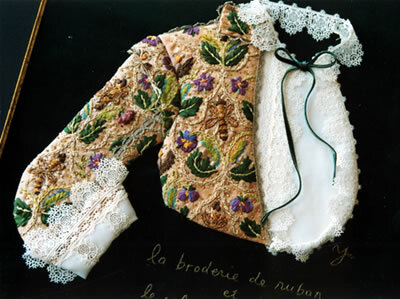 In this creation, I used Mokuba lace and ribbon embroidery to recreate part of a jacket in a portrait of a certain Frenchman who had gone over to England. The pattern is of flowers, such as violets and thistles, and insects, such as long-legged wasps and caterpillars, and is very much in the Victorian style.